North Korea is committed to denuclearization, its leader Kim Jon Un told South Korean President Moon Jae-in at a meeting Saturday between the two leaders. Kim also said he was still willing to meet President Donald Trump for the peace summit originally planned for June 12 in Singapore, but cancelled Thursday by Trump. The two Korean leaders met for the second time in a month to discuss an end to decades-old hostility between the two countries, and the venue for the Saturday talks was the North Korean part of the Panmunjom, the border village on whose South Korean side Kim and Moon met for their first historic meeting April 27. "Chairman Kim Jong Un once again clearly affirmed that his commitment to complete denuclearization remains firm yesterday. What remains uncertain to Chairman Kim Jong Un is whether he can trust the U.S. promise to end their hostile relationship and guarantee North Korea’s security once the North denuclearizes," Moon said Sunday in a televised press conference. The North Korean concern about future U.S. behavior is not entirely without merit, especially after Trump’s new National Security Advisor John Bolton advocated for a “Libya model” for the East Asian country’s denuclearization. If statements by the isolated, impoverished country are to be taken on face value, it would seem North Korea is keener on peace on the Korean Peninsula that it cares about a cordial relationship with the United States, or even its economic well-being. 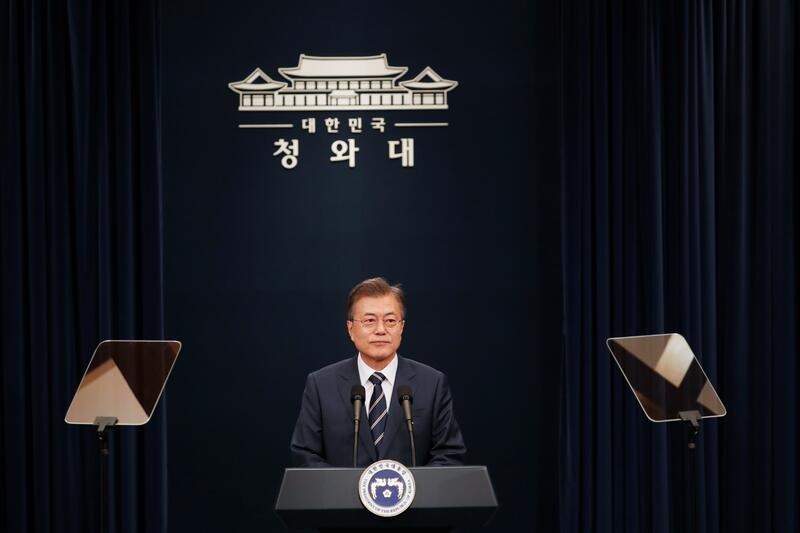 An example is a statement Sunday in the country’s state-run official media outlet, the Korean Central News Agency (KCNA). Prior to the Saturday meeting between the two Korean leaders, which Moon said was held at the behest of Kim, North Korea invited foreign journalists to witness the dismantling of its nuclear site at Punggye-ri on Thursday. The reporters confirmed that tunnels at the site had been blown up, but the extent of the site’s dismantling could not be verified by any experts. Pyongyang wants to give up its pursuit of nuclear weapons by dismantling the requisite infrastructure in a phased manner, a strategy seen as delaying the process so it can negotiate better in any talks with the U.S. or other world powers. Other than this week’s public gesture at Punggye-ri, North Korea has also put a freeze on long-range missile and nuclear tests, and it also released three U.S. citizens held in its captivity earlier in May. But the seemingly unilateral actions have not been met with any concessions by the U.S. so far, except the now-on-now-off promise of a meeting between Kim and Trump. Following Trump’s announcement of the Singapore meeting being cancelled, North Korea issued a statement saying it was still open to the talks, a point Kim reiterated to Moon on Saturday while thanking him for his efforts toward the U.S.-North Korea talks. “As both Chairman Kim and President Trump sincerely wish for the success of the North-U.S. summit, I stressed the need for the two sides to remove any misunderstanding through direct communication and to hold enough dialogue on agenda issues that need to be addressed at their summit. Chairman Kim also agreed,” Moon said during the conference. On Saturday, Trump again suggested the planned summit may proceed as scheduled.